I’m a confessed wild mushroom hunter; I love foraging for wild mushrooms much to my husband’s (Dean) concern. He had learned as a child never pick or eat wild mushrooms because they will kill you. If you don’t know what you are picking he is probably dead right. 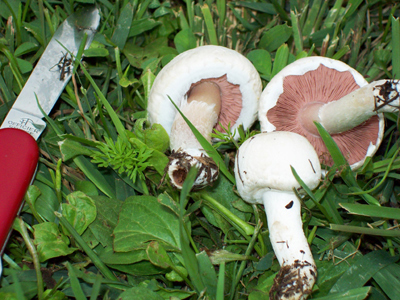 It is true that there are some mushrooms that are poisonous and some that are edible and safe. 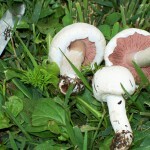 You know that you can buy cultivated mushroom at the store, eat them and enjoy them without dying. But I do like picking mushrooms. I guess I like to live on the wild side sometimes. I only pick one variety. I was shown how to find them and I feel pretty sure I can identify them safely (Dean starts to perk-up with the “pretty sure” comment). They are called pinkies and commonly grow in cow pastures. When I learned how to identify them from a friend, I was already an avid wild food forager. I have a natural ability to identify and remember plants. Dean is horrible at this (no offense, honey), I still have to point out poison ivy to him (not unlike my son and his friends poison ivy debacle! ), as well as the weeds he left when weeding, and the plants he weeded by mistake. Dean says I’m crazy for foraging for wild mushroom; I don’t know, what do you think? If you would like to keep in touch with what happens on our farm and with Alabu, sign up to become an Alabu Friend. New Friends receive a great special offer! Posted by Maryclaire Mayes on Thursday, September 19th, 2013 at 13:00 and is filed under My Life and Family.